An Indigenous American cemetery has been uncovered in Playa Del Rey, California. 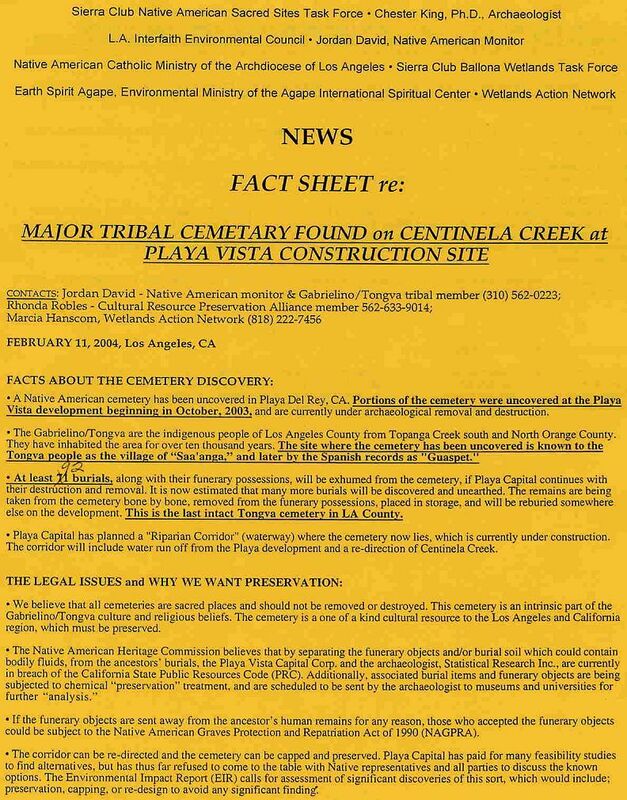 Part of the cemetery was uncovered at the Playa Vista development that began in October of 2003. Currently, there has been destruction of 116 Indigenous American burials, removal of Indigenous American human remains, and the separation of funerary objects from the human remains to which the objects belong. It is the understanding of SENAA International that the Gabrieliño/Tongva people, the tribal descendants of those buried at Playa Del Rey, were not included in any discussions regarding the treatment of the site, the graves, the funerary objects, or the human remains buried there. All entities involved in the destruction of the graves are aware that the area was inhabited by the Gabrieliño/Tongva people and that the site in question is known to be the site of the ancient village of Saa'anga, later called "Guaspet" by the Spanish. There was, therefore, no reason for failing to notify the tribal descendants of those buried at the Playa Del Rey site. If this had been a non-Indigenous cemetery, neither the local, state, nor federal governments would have allowed the destruction of the property; and they certainly would not have allowed the disturbance of human remains or the removal of funerary objects from the graves. Indigenous American human remains are not archaeological curiosities. Indigenous American graves contain the remains of human beings just the same as non-Indigenous graves and should be protected by the same state laws that protect non-Indigenous graves, funerary objects, and human remains. This is not simply a violation of state and local laws. Such desecration without notice to the descendant tribal entities is also a violation of the Gabrieliño/Tongva's religious rights, and the federal Native American Graves Protection and Repatriation Act of 1990 (NAGPRA). Because this is an issue that has the potential of adversely affecting the historical, sacred, and burial sites and the religious rights of every First Nation within U.S. borders, SENAA International is compelled to become involved and to urge all who value their religious, civil, and human rights to join the Gabrieliño/Tongva people in protesting this blatant and disgraceful violation of their rights, by demanding that the cemetery of their ancestors be restored and preserved, and in imploring the developer and appropriate government entities to find an alternative plan that will not involve the destruction of Saa'anga village and cemetery, designated as archaeological site number CA-LA-62. 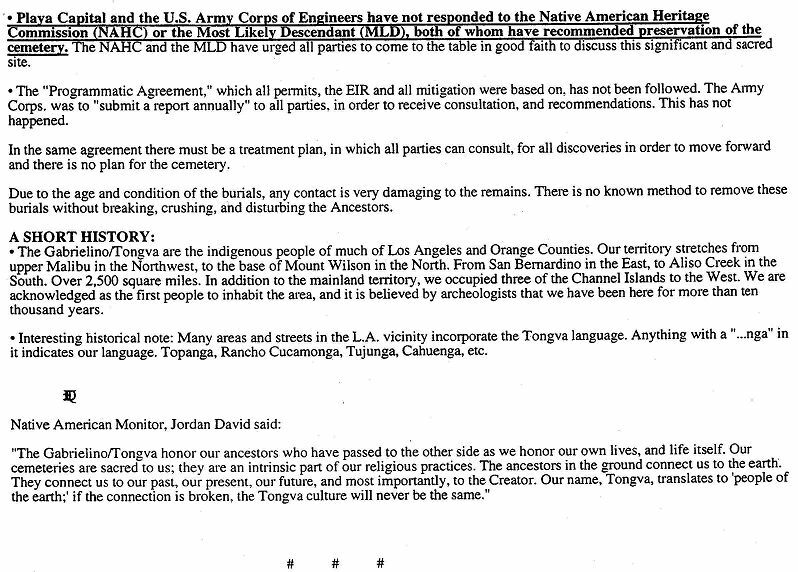 Below are links to documents released by the Gabrieliño/Tongva detailing the issue. 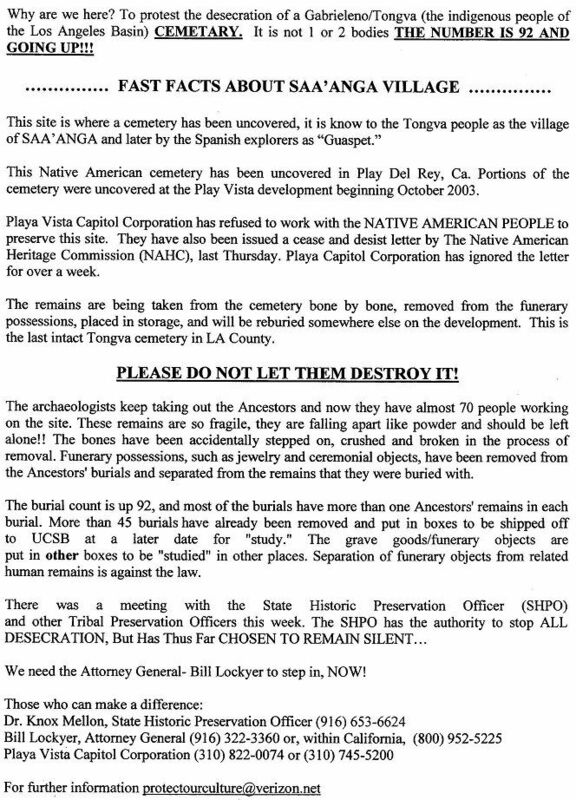 You will find three fact sheets that will inform you of the situation, a letter that you can download and/or print to voice your support for preservation of the site, and a list of names and addresses of those who should be contacted and urged to stop the desecration and restore the disturbed graves. SENAA International and SENAA West urges everyone to print and mail the letter provided by the Gabrieliño/Tongva and to write letters in your own words to those listed in the contact sheet. The letter and contact list can be downloaded or printed and is available in Word, PDF (Acrobat Reader), plain text, and HTML versions.